A trio of listing from CMDstore.ca has shed some light on some potential future Siege listings. First off, we have a new listing in the form of a Voyager Apeface. This is a very exciting possibility as it gives us another Headmaster from the Titans Return days to finish off our collections of Decepticon Headmasters. The Siege line has also recently revealed another triple-changer in the line via Springer. So, introducing another triple-changer doesn’t seem too far out of the realm of possibility. Lastly, we were recently shown that Commander Jetfire’s cockpit can fit Titan Master figures. So, reintroducing this feature seems like a good time to coincide with Jetfire’s release. 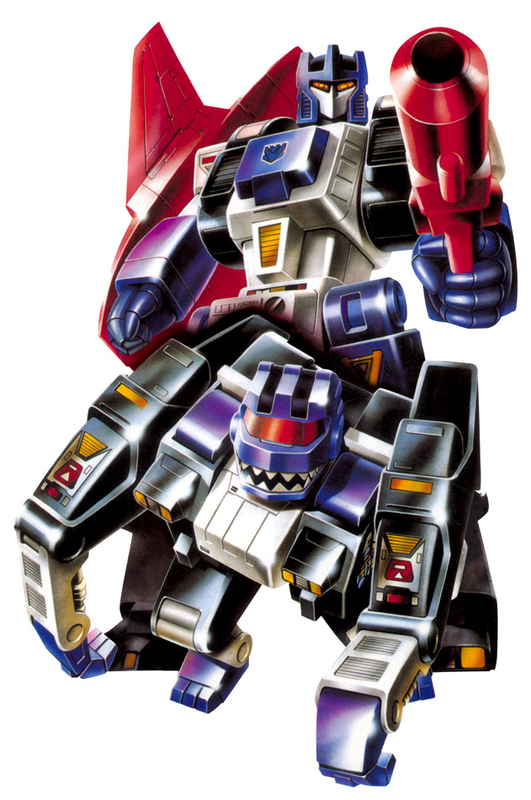 Speaking of Triple-Changers, we recently posted a rumor about a leader class Astrotrain. This site also lists the figure, reinforcing the legitimacy of the rumor. Lastly, CMDstore also lists Deluxe Siege Barricade (which we’re assuming is a reuse of Siege Prowl) as being a part of Wave 4, who will also include Mirage and Impactor. Siege Wave 4 is expected to be released in early October according to Hasbro and our various sponsors. We already have confirmation Astrotrain's wavemate is Ultra Magnus. I don't see them carrying UM over to WFC 2. The only example of mixed line cases I can think of was the transition between Beast Wars and Fuzors where the early Fuzors came packed with late BW toys. I'd need to check if this happened in the US but it was definitely the case in Europe. And that was TWENTY years ago. I don't expect Apeface and Astrotrain in Siege Line. I think Apeface and Astrotrain will be in WFC 2. For anyone wondering Astrotrain has been listed in Walmart's system. I haven't been able to find Apeface yet. So one more convention size info dump should remain but Botcon is gone and I do not think that SDCC will be the venue for these except for a select few. I think that Lancer, Greenlight, Firestormer and Skywarp will be Amazon exclusives releases around Prime Day/SDCC like the Prime Wars sets and Nemesis Prime. I think the majority of SDCC will be focused on WFC 2! The rest will probably just be revealed via renders on Facebook and Instagram. SDCC is a good bet, and I wouldn't expect to see anything before: POTP and Siege made their debuts there for a cDecember release. NYCC if they don't – Siege's w1 Decepticons were shown there last year. If this figure doesn't come to be I'm gonna turn into an Ape! Face! Wonder if they will add an extra joint to the headmaster's legs so he can be both bot head & ape head like the original Apeface. I think they'll probably go a route similar to TR Sixshot and Sawback and have the titan master form the "core" of the beast head, but not all of it. IIRC in The Rebirth – and cartoon accuracy is in at the moment – the Headmasters didn't form the Horrorcons' Beast Mode heads. In a way this kind of makes sense, they always were a bit of an oddity in that respects, all the other Beast Headmasters had pilots. So that then saves Hasbro the faff of having to engineer the Titanmasters to tripplechange. As the easiest way, and one that conforms to the cartoon I'd lay money this is the route they'd take. True. That's why you'd have to just abandon the idea of his head(s) also being a little robot. It kills the headmaster gimmick and that would likely bum some people out. I was just speculating on how they might pull two faces off one tiny figure. Will just have to wait & see what cards( or heads) are up Has/Taks sleeves for this guy. And they better do Snapdragon too, gosh darn it. I see what your saying, but then instead of the bot face only be on the back when the TM is not connected to the transtector, he would have the ape/face for a chest. That would look too weird even for Apeface. imo. What if they abandoned the titan master idea but kept the tooling concept? For example have a face on both side of the upper half of the TM–so both his back and chest have faces–and use the leg section to flip over and cover whichever face is not being used. I see what your saying, but then instead of the bot face only being on the back when the TM is not connected to the transtector, he would have the ape/face for a chest. That would look too weird even for Apeface. imo. First Rule of Fight Club: Don't make life difficult for the board mods. Second Rule of Fight Club: Have fun and be polite, it aint that hard.